Chinook Landscaping was proud to be part of The Marc and Mandy Show. The show is airing now on City TV in Calgary. We shared “Tips from The Pros” and discussed several important ways to improve your landscaping. 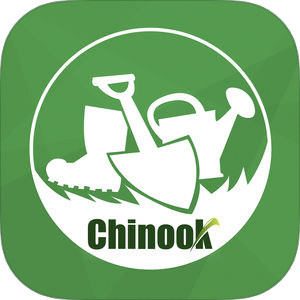 You can watch the City TV segment on Youtube here Chinook Landscaping and Design on The Marc and Mandy Show. Here is a sample of what we discussed on the segment. How to prevent water from pooling around your walkways. Preventing water from pooling around your walkways can be a challenge. It is one of the most common issues we face as landscapers in Calgary. Many homeowners or landscaping companies choose to bury their downspouts in order to divert water away from their walkways. This is not necessarily the best solution. Burying downspouts can often cause even more issues. These new issues can arise because the the area that is buried can take longer to thaw in spring time. Therefore the above ground free flowing water can run into an ice plug underground. This causes your eavestroughs to overflow or even worse, it can lead to frost heaving under your walkway. Frost heaves can cause cracks in concrete or high and low spots in your paving stones. To prevent burying your downspouts we often recommend and arbor be used. An arbor is a wood structure that can be simple or decorative. We typically build these arbors from cedar because they look more attractive. Arbors provide drainage solutions by straddling walkways and diverting water away from your walkway. We simply run the drain pipe over top the arbor and down the other side. It is a simple solution to what could be a very serious drainage issue. Arbors also provide great curb appeal for your front yard and they are inexpensive to install. The best way to create curb appeal for your property. Defining your borders! This is the key to great looking curb appeal. 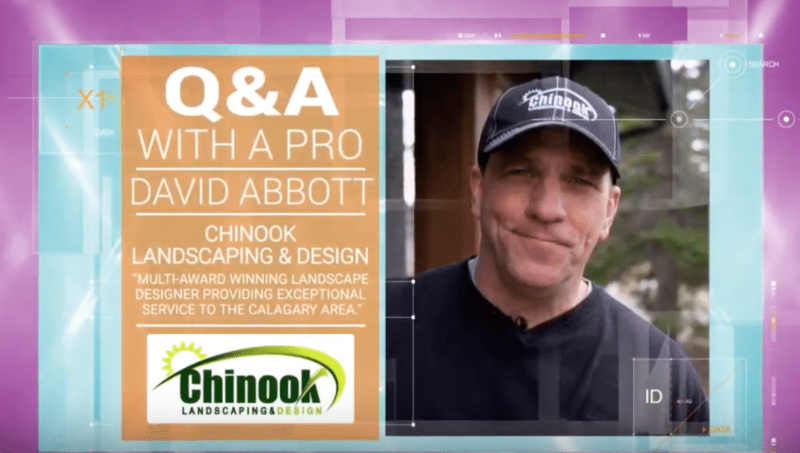 We discuss watch the video segment of Chinook landscaping and design on the Mark and Mandy show to learn more. Defining your borders simply means cleaning up those edges around your garden beds. 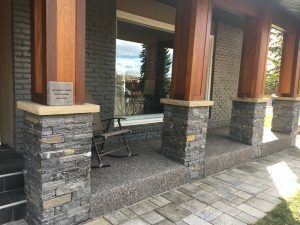 If you check out the TV segment Chinook Landscaping and Design on The Marc and Mandy Show you will see some great examples of how to create great curb appeal. Overgrown messy garden beds are not attractive and they distract from the overall look of your landscaping. We often see great looking garden beds with a nice selection of shrubs and perennials but the borders are not defined. Clearly defined borders look great and can be done easily without breaking the bank, You can define your borders by using a simple spade edge but this needs to be done annually. A spade edge means digging out sod or perennials around your garden bed in order to create a defined border. A better way to define your borders is to use mowing pavers or raised stack stone or even a vinyl edge. Mowing pavers are very practical because they allow you to mow your lawn easily by mowing right over the pavers. Mowing pavers mean you do not need to trim up against a garden wall or edging. A raised garden wall is another way to create curb appeal for your property. Garden walls create a bolder and more obvious defined border than other methods. Raised garden walls are more expensive than mowing pavers. Unlike mowing pavers, if you have grass bordering your garden wall you will need to trim up against it. You can eliminate the trimming by adding mowing pavers in front of your garden wall. Creating privacy in your backyard can be done in several different ways. Many of our customers ask about creating privacy in their backyards and this includes screening patios, hot tub areas or other locations. Creating privacy is important, especially in some of Calgary’s newer communities where homes are located very close to each other. Many properties back right on to neighbouring properties with no back alleys so privacy is very important if this is the case for your home. and that they include a warranty for their tree installations. Shrubs add privacy around hot tubs and fireplaces. 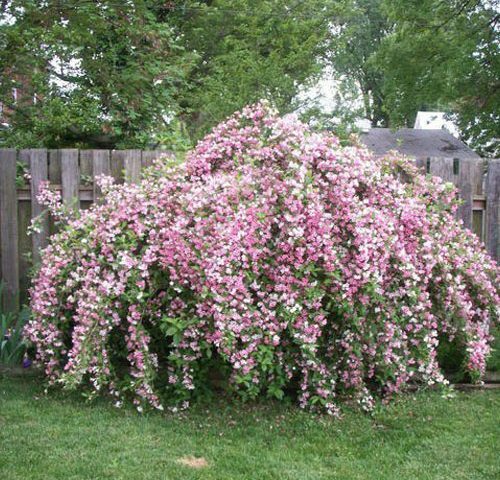 page to view may photos of large shrubs that are a perfect fit for creating privacy in your back yard. The use of wood structures for creating privacy in your back yard is becoming more and more popular in Calgary. Arbors, Pergolas and privacy screens can all be used for softening your landscaping and at the same time creating privacy. Arbors can be placed in an area of your patio or garden bed that provides a screening affect from neighbours. Arbors look great nestled in the corners of lush garden beds especially if the wood material used us cedar or Meranti. You will have not doubt seen Pergolas around the city of Calgary. Pergolas often straddle patios or decks. They are a four post structure with beams running along the top. We use pergolas quite often for creating privacy as well as some shade over top decks and patios. 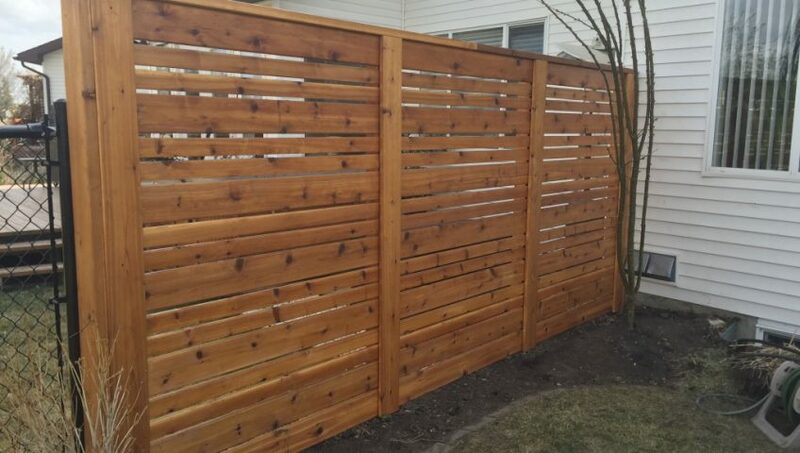 Rich wooden privacy screens are a great way to soften your landscaping and warm up your back yard environment. Privacy screens can be built at the side of decks or patios or fire pit areas. We often install privacy screens using horizontal slats so it gives you a semi transparent look. Creating privacy in your backyard can easily be done with a small or large privacy screen depending on how large your screen needs to be. To add more colour to your privacy screen you can plant a selection of colourful shrubs just in front of them. These shrubs should not be tall growing as they will eventually distract from the beautiful look of your privacy screen. We get a lot of calls from Calgary homeowners asking us about paving stone repair. 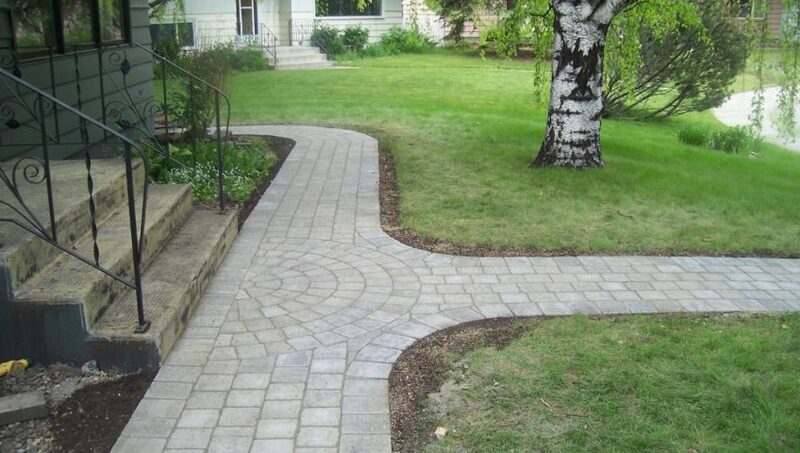 Paving stone patios and walkways or paving stone driveways are common in Calgary. Over time the paving stones can heave due to frost heaves, drainage issues or tree roots. Many of these paving stone structures have been there for many, many years so the paving stones themselves are old and outdated. For paving stone repair to be done properly you have to start by creating a proper base. As with all landscaping components, preparation is the most important part of the project. Simply removing the paving stones and adding or removing a little of the base is not sufficient. The best way to repair your paving stones is to remove the paving stones from the heaved or sunken area. Also remove the paving stone from a portion of the affected area even if they are not in need of repair. Then remove the sand and check to make sure there is an existing compacted gravel base. If there is not an existing gravel base then that is likely the cause of your paving stone issue. To properly re-install the paving stones you will need to add a compacted gravel base. This gravel base will prevent frost heaves and damage from drainage issues. IF you are looking for a quick fix then you can simply add or remove some sand but this won’t be a good long term fix. Are roots the cause of your paving stone issue? Tree roots are often the cause of paving stones heaving and they can cause real damage to patios, walkways and driveways. You many be dealing with a city tree that cannot be removed. Or, you like the look of the tree but you don’t like the damage it is doing to your paving stones. If tree roots are the cause of the paving stone damage, then notching out the tree root might be your best solution. Spruce tree and poplar roots are the most common culprits and their roots can be cut or notched out with a hand or power saw. If the root is very large then notching out a piece is probably better than cutting through the entire root. Then, cover the notched out area with sand or a compacted base. The root will likely continue to grow and will eventually lift your paving stones again in the future. Removing the root entirely reduce the chances of the heaving returning in the future. Should you consider new paving stones? If your paving stones are very old and outdated it is probably best to start fresh with new modern paving stones. Paving stones have come a long way and there are now so many great styles and colours to choose from. It often costs the same to repair your old paving stones as it does to install entirely new paving stones. Paving stone repair is an extensive process and most of the costs are in preparation of a proper base. You can add real value to your property by adding new modern paving stones. We always recommend completely replacing your paving stones if they are older and outdated. Call Chinook Landscaping and design today for your free paving stone consultation and estimate. If you live in one of Calgary’s older communities you are probably already very familiar with problems with Poplar trees. The city of Calgary planted thousands of Poplar trees in the 1960’s and 1970’s. Many of these trees were planted on Calgary boulevards. Unfortunately, many were also planted in front of residential homes. 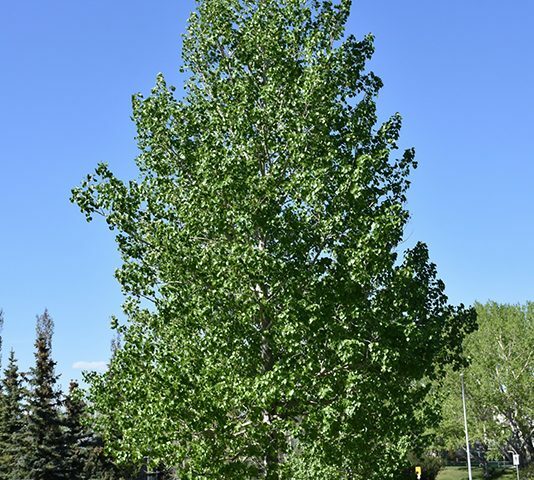 Over the years these Poplar trees have become huge and their size and evasiveness has caused numerous issues with Calgary residential properties and sidewalks. It is likely the city of Calgary regrets planting these very destructive trees as they have cause so much damage throughout the city. What are the problems with Poplar trees? Poplar trees can grow to be very large. There are many problems with Poplar trees . Their roots do not run deep but instead they are very shallow. These shallow roots can be up to 12″ across and they have the power to lift sidewalks, paving stones, driveways and retaining walls. We have seen many examples of this destruction while visiting with our Calgary clients at their homes. Poplars have a need to breed and their root structure is extensive. Their root system also creates new shoots that can become full grown poplar trees over time. Poplars not only have very evasive root systems but they are also have very fragile branches. Considering Poplars are such a huge and strong looking tree, they are surprisingly fragile> You may have witnessed the aftermath of a wind storm in Calgary and seen the branches strewn allover the streets. The majority of these branches are from Poplar trees. Poplar tree branches are extremely fragile. A small child can easily break these branches off without much effort. In high winds these branches break off and at times even entire limbs snap and fall to the ground, damaging cars, homes and surrounding landscapes. Is your poplar tree a city tree? If your Poplar tree is causing you grief, you may find that getting rid of it will cause you even more grief. Poplars are protected to an extreme in Calgary. As destructive and evasive as they are, the city has made it a priority to protect them. Removing them or even pruning them may be a battle especially if the trees is fronting your property and is deemed to be the property of the City of Calgary. Is a city of Calgary tree on your property? 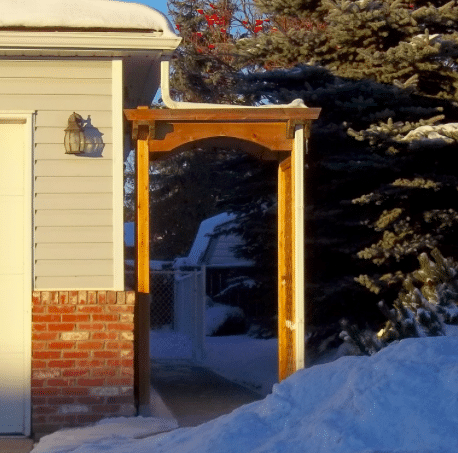 The city of Calgary has come up with an exhaustive list you must conform to in order to have them consider allowing you to remove your Poplar tree. This list includes getting permission from your neighbours to remove the tree, paying for the removal yourself and planting a replacement tree. 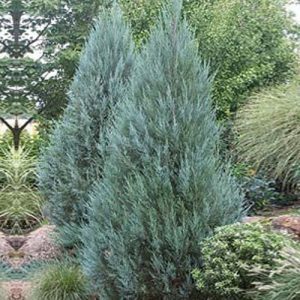 Chinook Landscaping Calgary has great options for great looking trees to include in your landscaping Calgary project.Check out our trees Calgary page for more information. Quite often we find that the most common tree homeowners want to remove are poplar trees. Poplar trees were planted throughout the 1960′ and 70’s in Calgary’s older neighbourhoods like Lake Bonavista, Acadia and many others. The Poplar trees are now huge trees that can cause lots of damage to lawns, driveways and sidewalks. Their extensive root systems can lift concrete and even break concrete structures. 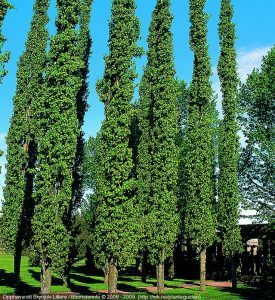 As well, the poplars are very fragile trees for their size so after a windstorm you will find branches strewn all over lawns and city streets. Some branches are heavy enough to damage vehicles. This poplar was not a good species for the city to plant and I am sure they regret it now. Regardless of the poplar trees drawbacks, removing poplar trees in Calgary can be quite an ordeal if they are on City property. Here are the City of Calgary’s conditions for removing a city Poplar tree. The poplar concern cannot be easily remedied through other means and is of significant nuisance. The Poplar tree must be a city tree and are typically planted on city boulevards or frontage of your personal property. Even though the poplar trees is the City of Calgary tree, the homeowner mist pay for all removal costs. Tree removal must be done by City of Calgary parks. A survey of twenty residences must be completed. Ten residences across the street from your property and five residences on either side of your property. Your neighbours must sign the survey and express whether they want the tree to stay or be removed. Make sure to do your due diligence to find out if a City of Calgary tree is on your property. Check out our trees Calgary page to view photos of trees that would be suitable to plant in you front or back yard. What is the best time to prune trees and shrubs in Calgary? When it comes to maintaining yards, gardens or orchards, pruning always pops up in our minds. Though done when required, the timing of the practice usually matters a lot. Some have opted to prune as early as spring after snow has cleared while other have waited for mid-fall. Regardless of the window you might take chance of, it will solely depend on the type of plant, be it a tree or a shrub, and whether they blossom in spring or summer. Nonetheless,pruning is importantbecause of obvious reasons like it enables rejuvenation of plants and aids in weeding out affected, unwanted and unproductive parts, thus increasing the potentiality of the plant. With that in mind, occasional yard clean-up, care and maintenance is crucial but what is the best time to prune trees and shrubs in Calgary? Fear not as we will reasonably discuss the times to do this at home. In Calgary, plants behave differently in seasons with the exception of evergreens. There are those that are active during spring and become dormant when winter comes. The ideal time to prune those trees would then be within that period of dormancy. Why? Because the plant, as the name suggest, is dormant; shutting down for ‘renovation’. After the leaves have all fallen and signs of hibernation are existent, sharpen your tools and cut what is not needed. This period is advantageous because the plants experience no stress and there is minimal chance for them to get infection or fungus after mid-October. For evergreen shrubs and treesof course, they can be pruned anytime of the year. They usually require little to no pruning. For flowering shrubs, try pruning them during early spring and avoid pruning them when winter approaches, around late September. This way, you will avoid making them vulnerable to winter frost conditions as their wounds wouldn’t have recuperated or hardened by then. In Calgary, mid-fall has been the perfect time to trim perennial trees such as birch and maple simply because they reproduce during winter, among other reasons. But other trees like spruce, junipers, crabapple and popular are well suited for pruning during winter. So why should you clip and trim your trees and shrubs during mid-fall towards winter? Fungal diseases, infections and pests are usually dormant making it easy for their eradication. The plant will face no stress and sap loss will be curbed. The structure of the plant is visible enough after leaves have fallen thus making it easy to identify what can be cut off and what can’t. When pruning at this period, few branches will be left, enabling the roots to reserve more food and energy for new growth and life in the coming season. If you look forward to trimming down overgrown shrubs and trees that might be costly in the event of storms in Calgary, or just want to increase the aesthetics of your yard with well-shaped and well-kept hedges, shrubs and trees, sharpen your tools and start pruning your plants at the right time. When difficulty arises, as it always does especially where powerlines are near the home area, consults your landscaping Calgary specialistsi. Spring is just around the corner and so you know all that snow has got to go somewhere. Is your property able to property manage drainage from snow, spring runoff and the inevitable spring rain? Lots of snow is beneficial to trees and shrubs but it can cause serious drainage issues around your property if the grading is not adequate. Drainage is a key concern for many Calgary homeowners. Homeowners are concerned about water draining towards and around their foundations. They are also concerned about water setting around patios and walkways causing freezing and slipping hazards. We can provide you with drainage solutions for your property and here are a few examples of drainage solutions you can implement to keep your property safe. It is imperative to have positive drainage away from your foundation. This is done by creating a slope where the high point is against your house and the low point is away from your house. You will want to create this slope with the soil before you add sod, decorative rock or any other topping. Creating this positive drainage will help to keep water away from your foundations. We grade our slopes at about one inch for every eight feet. We implement this on all of our grading including patios and walkways. You may find that over time your property has settled and therefore your lawn or patios or walkways have settle along with the sub surface. In some cases this may require removing the surface layer of sod or walkway and regrading the property so the proper slope is present. We constantly encounter issues where downspout placement is inadequate or where downspouts are not placed in the correct areas. We find this issue to be most common around walkways, especially high traffic walkways in front yards. Downspouts need to be placed in areas where they will not allow water from your eavestrough to drain onto walkway. Sometimes this will require adding to or adapting your existing downspouts so they will help with drainage. Many homes have neglected downspouts that remain in bad areas for years. This can eventually cause erosion to your property, wash out of soil and gravel and even water making its way through foundation cracks and into your basement. Try to place your downspouts in an area where it will serve your property best. Some times placing your downspouts into or towards garden beds will help provide your trees and shrubs with water throughout the season. Just make sure the garden bed is not right next to your foundation. If at all possible it is important to avoid burying your downspouts. We find this to be one of the most common landscaping mistakes Buried downspouts can cause all sorts of long term problems so whenever possible make sure to run you water overland and not underground. One of the main reasons buried downspouts are an issue is simple. The water below ground thaws last in the spring time. The water on your roof, in your eves troughs and downspout drains first. So during Calgary’s big thaw in spring time all of the thawing water from above ground runs into a solid iced plug that is located underground. This means your eavestroughs will not drain properly because there is no where for the water to go. The backed up water will likely freeze again as cool weather returns and that can cause all sorts of problems to your landscaping. We have creative drainage solutions such as using an arbor for a drainage aid. This process involves running your drain pipes over to the arbor, allowing you to avoid burying your downspouts. We often use decorative arbors as a drainage aid. We use these arbors to straddle walkways and we run the drain pipe or downspout over top of the arbor and to the other side of the walkway. This diverts the water and drainage away from the walkway. The arbor also provides an attractive landscaping feature in your front or back yard. The drain pipes can be hidden in the arbor so that they are not visible. See our page arbors and pergolas for your front or back yard for more on this subject. If your property would be improved by the look of a beautiful cedar arbor you could consider this option as one of your drainage solutions. You can use plantings to absorb the water from some of your drainage. Trees, shrubs and sod can really help with drainage issues especially if they are located in key areas. If you are planning a new garden or new landscaping then Planting trees and shrubs in these key areas would be a great idea. We find that larger trees and shrubs work best for this application as they require more water. When planning this method make sure that you are not diverting too much water to your trees and shrubs as overwatering trees and shrubs can be as harmful as under watering. Using run off water for trees and shrubs is a great way to recycle and it will save you time and money as your hand watering will be minimized. Rain barrels have become very popular in landscaping in Calgary. The idea behind rain barrels is to capture the run off from your downspouts or rainwater and use that water for other purposes around your gardens or landscaping. You will see most rain barrels at the side of homes next to the downspouts. Some homeowners use small pumps in their rain barrels that lead to a hose for hand watering trees, shrubs and perennials. Rain barrels are a great way to collect water and recycle the water. French drains are often used as a last resort when overland drainage is not possible or if there is just too much water for your property to handle. Most properties in Calgary are designed to manage the drainage overland without the need of underground drainage solutions. French drains involve digging a deep hole somewhere on your property and filling the excavated area with washed rock. The water is then diverted to this area away from your home and foundation. The diversion can be done naturally or with the use of weeping tile or Big O drainage pipe. French drains if built properly can handle a very large amount of water and will greatly reduce the amount of water you have on your property. They don’t require any substantial maintenance and can be left alone for years. Our estimates include all sorts of ideas for drainage solutions. Contact us today for your free consultation and estimate. 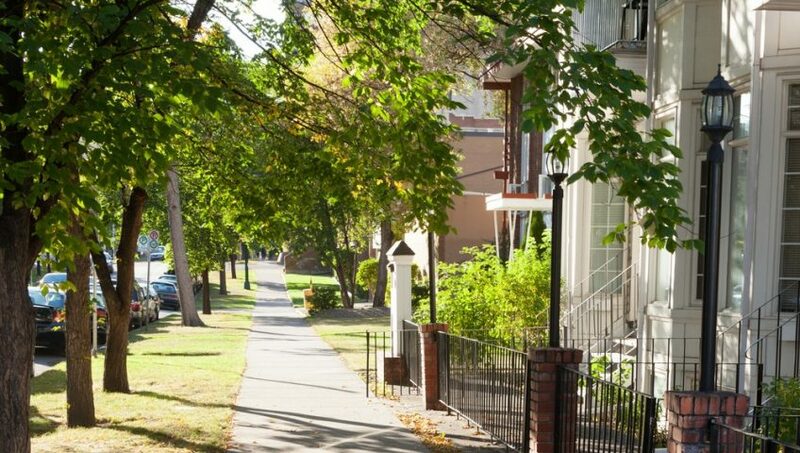 Calgary has many older neighbour hoods with older homes built in the 1960’s and 70’s. Many of these homes are located in communities just outside the city core. They include Lake Bonavista, Acadia, Haysboro, Lakeview and many other communities. Many of these homes have old style pillars built at their front entrances or straddling their front steps. If you want to look at other options besides simply painting over the steps then you may want to considering cladding your pillars with wood, stone or both. You can transform your pillars with stone or wood cladding and it will totally change the look from old and dated to new and fresh. Stone cladding is another way to transform your pillars. Stone cladding is a more costly option than wood because it is more labour intensive. There are endless possibilities when it comes to stone cladding. These include natural stone and cultured stone, often called artificial stone. Some high end cultured stone can looks as authentic as natural stone. If you want to insure the look remains the same for many many years then natural stone is the way to go. Natural stone will not fade or change colour over time. Cladding your pillars with stone will give your pillars a bold and rich look and the stone matches very well with natural wood cladding. 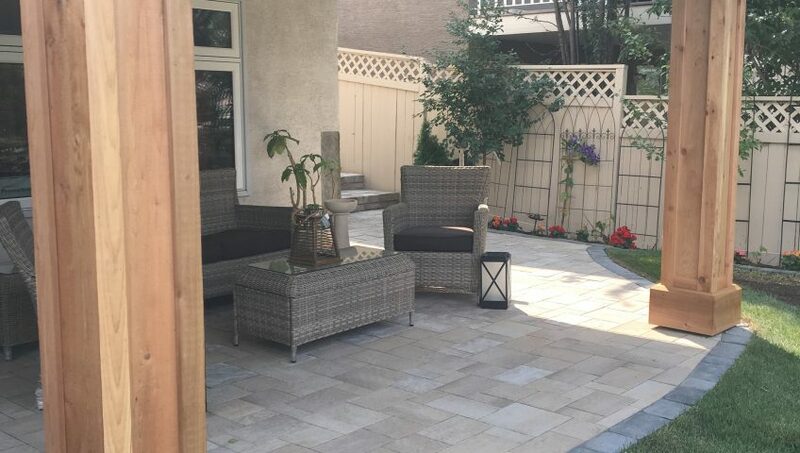 Stone cladding goes extremely well with paving stones exposed aggregate or concrete patios. Stone cladding can also be installed on the facing of your actual house in the front or back area. If you have some front walkway ideas you could consider matching your new front pillars with the new ideas. Both natural wood and natural stone cladding will go very well with any natural stone you have on your property. The two are meant to be together! Chinook Landscaping and Design works with a number of great natural wood and stone suppliers. You can visit their websites by clicking on the links below. Front step ideas are often not talked about much in the world of landscaping. You can create a beautiful new landscape but forgetting about your old, cold, concrete steps can make for an eyesore in the middle of your Oasis. The term most commonly used for the standard front step in Calgary is broom concrete. This means a simple grey concrete mixture is poured and then broom finished. Boring broom concrete is not a pretty site and often the concrete is stained, faded and chipped. Dressing up your front step does not have to be costly althoughthere are some more expensive front step ideas we will get into later. There are many inexpensive ways to spruce up your step that should be within the budget of most Calgary homeowners. You can choose to pour dyed concrete over your existing step. The least expensive option of a pour over would be to have the concrete dyed before it is poured. Concrete dyes for steps are usually some shade of grey. 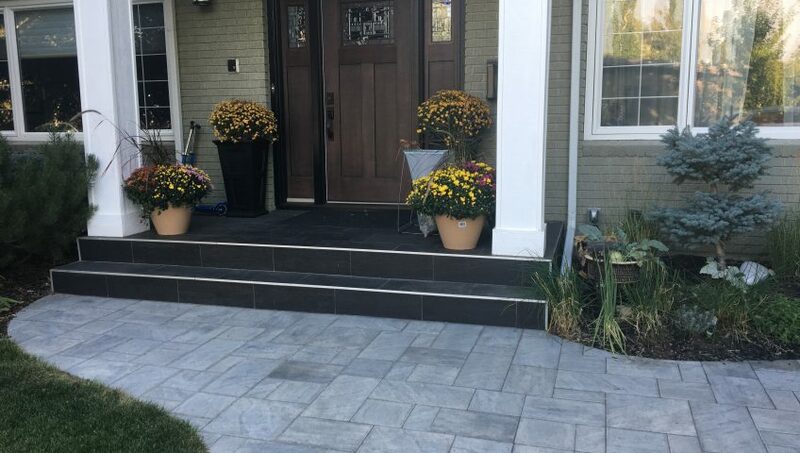 A darker grey definitely looks better than the traditional light grey concrete look and it will hide stains much better than a light concrete step will. In order for the new poured concrete to last and not chip or crack you will need to make sure you have at the bare minimum one inch between the existing step and your front door jam. Any less than one inch and the concrete will chip away in no time and you will be left with no inexpensive options in order to have it repaired. This is our first choice for front step ideas if you are needing to watch your costs. One of our favourite front step ideas is a pour over with stamped concrete or exposed aggregate. This is not a very expensive option and it will basically look like you have poured an entirely new step from scratch. You can choose to have your concrete stamped in many different patterns that imitate natural or modern looking stone work. A dye is also included with stamped concrete to help give it a rich finished look. Exposed aggregate is another great option and works especially well if you have existing exposed aggregate walkways. Exposed aggregate steps also look very good with paving stone walkways or traditional broom finished concrete walkways. As with the dyed concrete option you will need to make sure you have enough clearance above your existing step in order for a pour over to work and last for many years. Maybe it is time to start from scratch and break out the old and bring in the new. Removing your old concrete step may be the only option if you have limited clearance between your existing step and door jam, making a pour over impossible. If you want to start from scratch with an entirely new front step you will need to first have the existing concrete jackhammered out and hauled away. Once that has been done you can choose between the poured stamped concrete or exposed aggregate we talked about earlier in this article. Or you can choose to have a new step built out of either paving stones or wood. Although paving stones inset in stone retaining walls are often used for steps in Calgary this is not an option we typically recommend. This usually our last choice for front step ideas. The reason for this is simply because there are more components to this method and therefore the chances of your steps lasting for a very long time are minimized. Poured concrete of some form is in our opinion the best option for a front step. Front steps get a lot of use over time and therefore a very solid structure is imperative. In order to have paving stones as part of front steps retaining walls will have to be built. These retaining walls will then need to be filled with compacted gravel and then sand and paving stones are installed. These multiple steps mean there are many areas that can become weak over time. If your retaining walls settle even a little then your steps will be uneven and start to be a tripping hazard and a headache to shovel. There is no question that over time a solid poured structure will out last paving stones inset in retaining walls.